Welcome to the official page of Jeff Porter. Thank you for visiting and for your continued support. Your messages of encouragement continue to be my inspiration on this journey. Continue to Hurdle Beyond Limits! https://t.co/FqgHQ7Mymx This type of predatory behavior does not belong in the Olympic Movement & has got to stop! Hailing from New Jersey, Jeff attended Franklin H.S. in Somerset before competing for the University of Michigan, where he earned his degree in Kinesiology and a Master of Arts in Higher Education and Student Affairs, and was the 2007 NCAA Champion in the 60 meter hurdles. 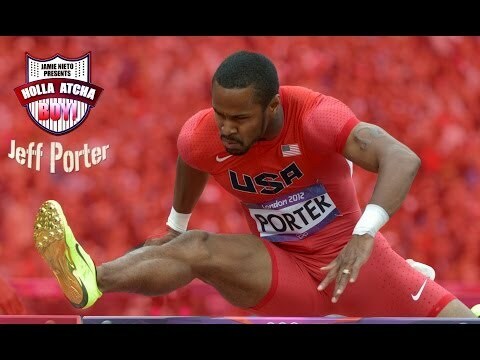 In 2011, Porter married his college sweetheart, Tiffany, who competes for Great Britain in the 100 meter hurdles. Off the track, when not at his full-time job with the University of Michigan, Jeff enjoys reading, writing, and fantasy sports. He is passionate for education and his inspirations for life on and off the track are his mother and late father. Jeff maintains a consistently positive attitude toward his work and life, noting that, "just because something has never been done, doesn't mean it can't." As Jeff says, "My will to win and be successful trumps all the temporary issues and concerns that occur daily." This was ever present when Jeff heroically dove across the finish line to make the US team for the London Olympics.